Random House Books for Young Readers, 9780385386173, 208pp. BOOM! CLANG! CRASH! D.J. and Gina are totally ordinary kids. But Hilo isn't! Hilo just fell out of the sky and doesn’t know where he came from, or what he’s doing on Earth. (Or why going to school in only your underwear is a BAD idea!) . . . 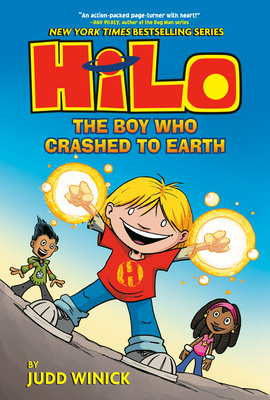 But UH-OH, what if Hilo wasn’t the only thing to fall to our planet? Can the trio unlock the secrets of Hilo's past? Can Hilo SURVIVE a day at school? Find out in HILO-a laugh-out-loud, epic story of friendship! Adventure! (And the occasionaly mutant space robot). JUDD WINICK grew up on Long Island, where he spent countless hours doodling, reading X-Men comics and the newspaper strip Bloom County, and watching Looney Tunes. Today, Judd lives in San Francisco with his wife, Pam Ling; their two kids; and their cat, Chaka. When Judd isn't collecting far more action figures and vinyl toys than a normal adult, he is a screenwriter and an award-winning cartoonist. Judd has scripted issues of bestselling comic series, including Batman, Green Lantern, Green Arrow, Justice League, and Star Wars, and was head writer on the Hulu network’s animated series, The Awesomes. Judd also appeared as a cast member of MTV’s The Real World: San Francisco and is the author of the highly acclaimed graphic novel Pedro and Me, about his Real World roommate and friend, AIDS activist Pedro Zamora. Visit Judd and Hilo online at www.juddwinick.com.